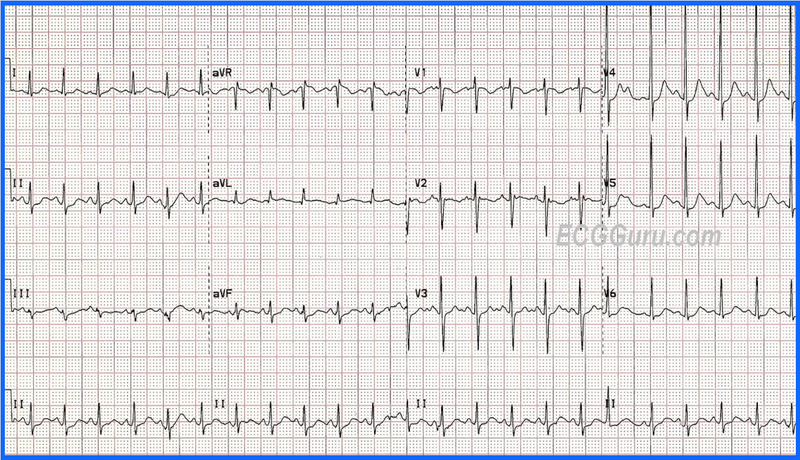 The ECG below was obtained from a 6-year old child with carbon monoxide poisoning. It shows Sinus Tachycardia at ~ 135/minute. Sometimes even the simplest tracings make for excellent teaching/learning opportunities. HOW MANY interesting aspects of this tracing can you pick up on? I describe 8 such findings in detail. 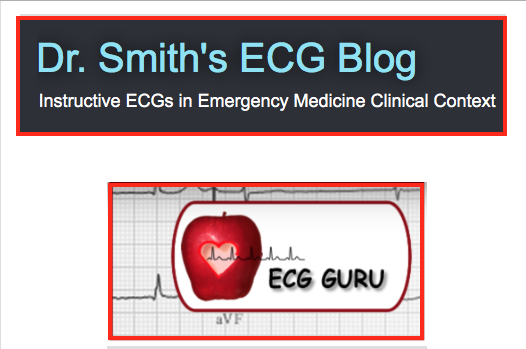 CLICK HERE for the My Discussion on the ECG Guru web site. Figure-1: 12-lead ECG and lead II rhythm strip obtained from a 6-year old child with carbon monoxide poisoning. 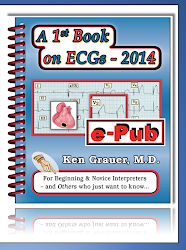 (This tracing is from the ECG Guru site). NOTE — Enlarge by clicking on Figures — Right-Click to open in a separate window (See text). Interpret the lead MCL-1 rhythm strip shown in Figure-1. What is beat #13? — Is the Ashman phenomenon operative in this tracing? Can you also explain the slightly different appearance of beats #4 and #7 compared to most other beats on the tracing? 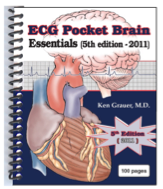 NOTE: You may want to refer to our ECG Blog #70 — in which we discussed the Ashman phenomenon in detail. Figure-1: What is the underlying rhythm in this lead MCL-1 rhythm strip? Does beat #13 represent the Ashman phenomenon? (Figure reproduced from ACLS-2013-Arrhythmias: Expanded Version- pg 218.) NOTE — Enlarge by clicking on Figures — Right-Click to open in a separate window (See text). The underlying rhythm in Figure-1 is irregularly irregular. The QRS complex for most beats on the tracing is narrow. No P waves are seen. 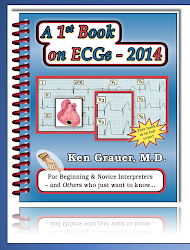 Therefore — the underlying rhythm is AFib with a relatively rapid ventricular response. Beat #13 occurs relatively early. 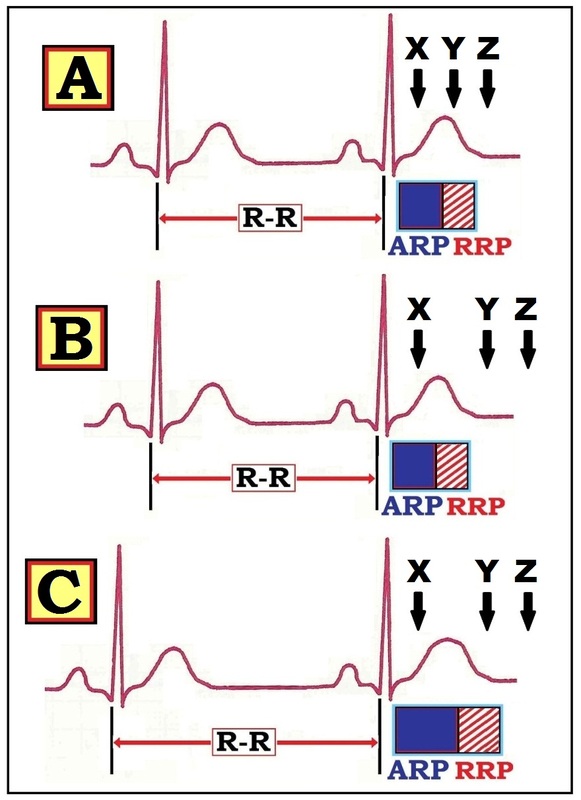 QRS morphology manifests a typical RBBB pattern with rSR’ complex showing similar initial deflection (upright) as for normal beats and taller right rabbit ear (Figure-2). This characteristic appearance of beat #13 strongly suggests this beat is not a PVC, but is instead an aberrantly conducted supraventricular impulse. Beats #4 and #7 in this tracing also look different than the normally conducted beats. They both manifest an rSr’ pattern, albeit not quite as pronounced as for beat #13. We strongly suspect the appearance of beats #4 and 7 reflects aberrant conduction with a pattern of incomplete RBBB. Clinically — it probably matters little whether beats #4, 7 and 13 represent isolated PVCs vs aberrant conduction of several AFib impulses. 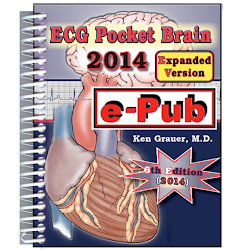 In either case — the primary problem is rapid AFib in a hemodynamically stable patient. As a result — management priorities rest with trying to find and “fix” the precipitating cause of AFib and with controlling the ventricular response. Regardless of the etiology of beats #4, 7 and 13 — it is likely that widened complexes will decrease in frequency (or resolve completely) once the ventricular rate of AFib is controlled. At first glance, beats #4, 7 and 13 in Figure-1 all appear to manifest the Ashman phenomenon — in that these slightly widened and different-looking beats all follow a relatively longer preceding R-R interval (ECG Blog #70). That said — the Ashman phenomenon is of uncertain value with AFib (Atrial Fibrillation). Marriott and Conover have emphasized that length of the R-R interval in AFib is continually influenced by the phenomenon of concealed conduction, in which variable penetration of the 400-to-600 atrial impulses that arrive each minute at the AV node with AFib affects conduction in a way that the preceding R-R interval no longer accurately reflects the duration of the subsequent refractory period. Another reason definitive diagnosis of aberrant conduction is more difficult in the setting of AFib — is that one loses the diagnostic utility of identifying a premature P wave (since there are no P waves with AFib …). Despite these caveats — we estimate a greater than 90% likelihood that beats #4, 7 and 13 in Figure-1 all represent aberrantly conducted AFib impulses because of their highly characteristic appearance. Specifically — beat #13 in Figure-1 looks identical to B in Figure-2, in that beat #13 manifests an rsR’ with S wave that descends below the baseline and taller right rabbit ear (R’ ) in a right-sided lead (such as MCL-1). Final Comment: It is good to be aware of the Ashman phenomenon — because this concept is often cited by those with an interest in interpreting challenging arrhythmias. That said — it will be relatively uncommon (if not rare) that one truly has opportunity to invoke clinical use of the Ashman phenomenon. Despite description of this phenomenon by Gouaux and Ashman in 1947 about a patient with atrial fibrillation — enhanced appreciation of the importance of concealed conduction in the setting of AFib reduces the diagnostic utility of the Ashman phenomenon to cases in which a widened early beat follows a long pause in a patient with sinus rhythm (and not AFib). What is the underlying rhythm? Is widened beat #12 a PVC or aberrantly conducted PAC? How certain are you of your answer? Figure-1: What is the underlying rhythm in this lead MCL-1 rhythm strip? What is beat #12? 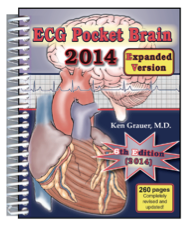 (Figures reproduced from ACLS-2013-Arrhythmias: Expanded Version- pg 215-217.) NOTE — Enlarge by clicking on Figures — Right-Click to open in a separate window (See text). The underlying rhythm is appears to be sinus — although it is admittedly difficult to determine the underlying sinus rate due to continual irregularity of this tracing. The reason we interpret the underlying rhythm as sinus is the similar P wave morphology and PR interval for beats #4,6,11 and 14. There are multiple PACs on this tracing. Although P wave morphology seems to change slightly for many of these PACs — it is admittedly difficult to be certain if some of the earlier-than-anticipated beats are PACs vs rhythm regularity from sinus arrhythmia. 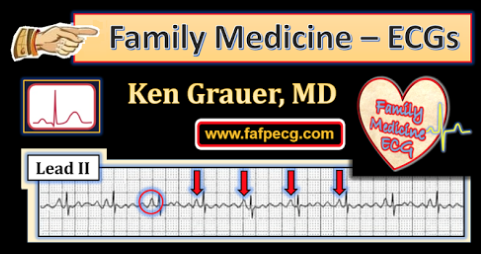 Clinically — it doesn’t matter, since “the theme” of this rhythm is sinus with multiple PACs. Beyond-the-Core: Technically — we can’t rule out the possibility of MAT for this rhythm. Our tendency is to favor sinus rhythm with multiple PACs as the diagnosis because of similar P wave shape and PR interval for beats #4,6,11 and 14 (vs continually varying P wave morphology from beat-to-beat that is typical for MAT). That said — sinus rhythm with multiple PACs and MAT are essentially two points on different ends of the same spectrum. Practically speaking, distinction between these 2 entities does not matter — since clinical implications of these two rhythms are virtually the same (See also ECG Blog #65). Beat #12 — is an aberrantly conducted PAC. We are able to confidently make this diagnosis because: i) Beat #12 is preceded by a premature P wave (arrow in Figure-2); ii) The “theme” of this rhythm is sinus with multiple PACs — so it is more likely than not that the cause of the single widened beat in Figure-1 will also be a PAC; iii) Beat #12 manifests typical RBBB morphology (rsR’ with taller right rabbit ear in right-sided MCL-1); and iv) Beat #12 manifests the Ashman phenomenon. Figure-2: Arrows have been added to Figure-1 to highlight the relative relationship between the coupling interval of the premature P waves preceding beats #5, 7 and 12 — and the preceding R-R interval. Beat #12 is an aberrantly conducted PAC that manifests the Ashman phenomenon (See text). Figure-3: Illustration of the effect that the preceding R-R interval exerts on duration of the subsequent refractory period (See text). Panel A in Figure-3 schematically illustrates that a premature impulse (PAC or PJC) occurring during the ARP (Absolute Refractory Period — corresponding to Point X) will be blocked. In contrast — a PAC (or PJC) occurring after repolarization is complete (corresponding to Z in Panel A) will be conducted normally. Aberrant conduction will only occur IF a premature impulse occurs during the RRP (Relative Refractory Period — corresponding to Point Y in Panel A). Events in Panel B — suggest a different clinical situation. Once again — points X, Y and Z represent theoretical timing for 3 PACs. Premature impulse X will again be blocked (since it occurs within the ARP). This time — both Y and Z fall beyond the RRP, so both of these premature impulses will be conducted normally to the ventricles. KEY Point: Whether a premature impulse will fall within the RRP (and conduct with aberration) — will also be determined by length of the R-R interval immediately preceding the anomalous (widened) beat. This is because duration of the refractory period is directly proportional to the length of the preceding R-R interval. 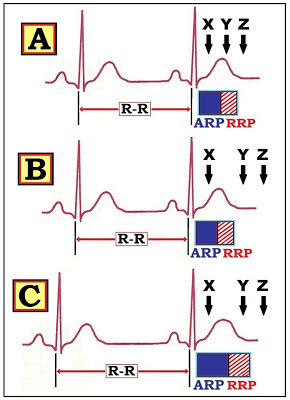 When heart rate slows (as it does in Panel C of Figure-3) — the subsequent ARP and RRP will both be prolonged. Panel C — shows the effect of rate slowing on conduction of the 3 PACs from Panel B. Premature impulse X will again be blocked (it occurs within the ARP). Premature impulse Z will again be conducted normally (it occurs after the refractory period is over). However, premature impulse Y (which in Panel B had occurred after repolarization was complete) — will now be conducted with aberrancy (since the preceding longer R-R interval has now prolonged the RRP ). 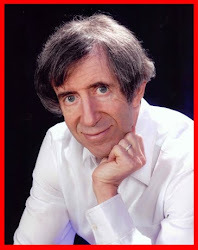 “The funniest-looking (ie, most aberrant) beat is most likely to follow the longest pause”. We magnify events from Figure-2 below in Figure-4. Note that the “funniest beat” (beat #12) follows the longest pause (the R‑R interval between beats #10-11). Therefore — in addition to the very short coupling interval of 0.22 second for the PAC preceding beat #12 (red arrow) — the relatively longer preceding R-R interval favors conditions that predispose to aberrant conduction (via the Ashman phenomenon). Cycle-sequence comparison for other PACs in Figure-4 (white arrows) is not nearly as favorable for aberrant conduction. Utilization of the Ashman phenomenon may be extremely helpful diagnostically when applied to assessing wide beats in arrhythmias obtained from patients who are in sinus rhythm. Be aware that the Ashman phenomenon is of uncertain value with AFib (Atrial Fibrillation). This is because the length of the R-R interval in AFib is continually influenced by another phenomenon known as concealed conduction, in which variable penetration of the 400-to-600 atrial impulses that arrive each minute at the AV node with AFib affects conduction in a way that the preceding R-R interval no longer accurately reflects the duration of the subsequent refractory period (Marriott and Conover). 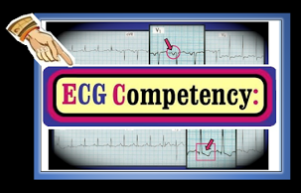 Please see our ECG Blog #71 — in which we further explore why the Ashman phenomenon is not diagnostic in the setting of AFib.